1. Choose accessories you can reuse in everyday life. If selected with care, shoes, jewelry, ties, shirts, and even suits can be worn after the big day. 2. Donate your wedding ensemble to a local charity that helps those who cannot afford a wedding. Read 5 Wedding Tax Deduction Tips, Plus One to avoid, here, for details about how this can also help you save on taxes. 3. Expand the possibilities beyond “wedding” brands and stores. Today’s weddings include a variety of styles, many of which are far outside what is considered traditional wedding attire. 4. Borrow parts of your wedding ensemble. As with every other aspect of your wedding, you have a great many options in terms of your veil. There are different styles, lengths, colors, shapes, fabrics, embellishments, and types of edging or trim to choose from. This may seem like a daunting list, and you may simply want to go to a bridal store and let them sell you one (which means you would probably overreach your budget). Each decision will build upon the one before it. In addition, your tastes and instincts will certainly influence your choices. If you need help understanding veils, read Veil Lengths and Styles Demystified, here. The ultimate veil-related savings is to skip it entirely! Some brides choose a nice hairstyle and a bit of bling to put in their hair, then call it finis, thus spending no time on veil decisions. 6. Make your own veil. 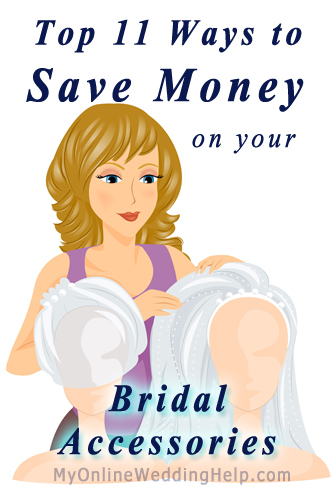 This not only saves money but also allows you to choose exactly how your veil will look. You can watch my video series or read how to make your own veil in five steps here. 7. Buy from a wholesale-priced merchant or on eBay, where you can purchase very inexpensive veils. Find veils under $20 from my partners here. 8. Buy a plain, already constructed veil and dress it up. Find a selection of unadorned veils here. Wedding headpieces run the gamut from traditional to the glittering, jeweled tiara. As you should with all accessories, consider your dress. You will no doubt want a headpiece with detailing similar or complementary to your dress. Most likely you will find a large range of prices. For the most part, but not always, this is due to materials and construction. 9. Buy affordable tiaras online. A large selection of inexpensive tiaras is here. These are generally made from tulle and provide fullness to the skirt of your gown. The fuller you want your dress to be, the more layers you will need to wear. Some makers also design slips with built-in volume. 10. Make your own crinolines. There are both tutorials on YouTube and sewing patterns available to guide you. 11. Buy used petticoats on eBay.